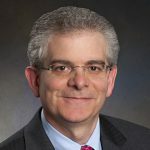 John Z. Ayanian, MD, MPP is the inaugural director of the Institute for Healthcare Policy and Innovation at the University of Michigan (U-M), which includes over 475 faculty members from 15 schools and colleges at the university. He is the Alice Hamilton Professor of Medicine at the Medical School, professor of Health Management and Policy at the School of Public Health, and professor of Public Policy at the Gerald R. Ford School of Public Policy. He received his bachelor’s degree from Duke University, graduated from Harvard Medical School, and earned his Master of Public Policy degree from the Harvard Kennedy School of Government. He completed his internal medicine residency and fellowship training at Brigham and Women’s Hospital in Boston. From 2014 to 2016, Dr. Ayanian served as an associate editor of the New England Journal of Medicine. He has published widely on access to care, quality of care, and health disparities related to race, ethnicity, socioeconomic factors, and insurance coverage. In 2012, he received the John Eisenberg National Award for Career Achievement in Research from the Society of General Internal Medicine. Dr. Ayanian is a fellow of the American College of Physicians and an elected member of the National Academy of Medicine.